This year my daughter is four and my son is two, so I think we will have a lot of fun with Valentine's Day Activities. 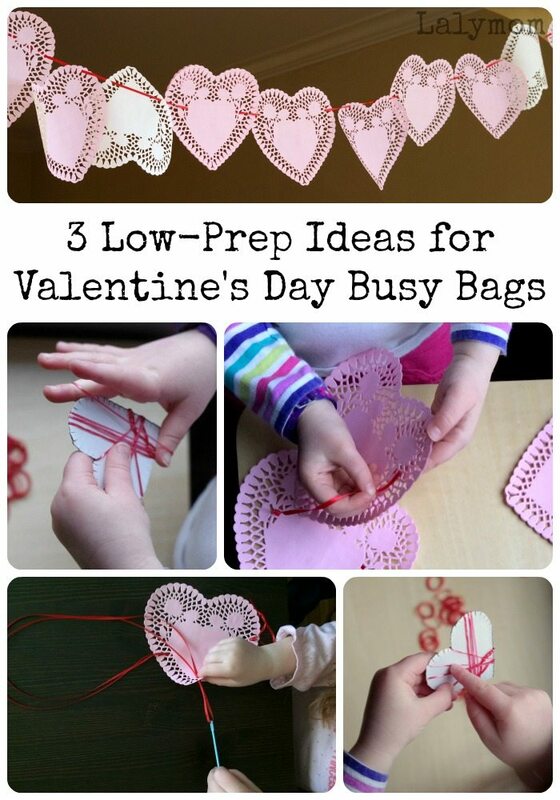 Today I have 3 super simple, low-prep ideas that are perfect for the Valentine's Day Busy Bag Blog Hop! Both of my kids do a lot of fine motor activities each week. A lot of them are great independent, quiet time activities, but others are fun to do together. I think these three ideas could be done either way. It really just depends on the ages and skill levels of your kids. Quick note, affiliate links are used in this post. Okay, time for the fun! I have older nieces and nephews who went through a huge Loom bands phase. I was playing around with them one day and really liked the specific size and elasticity of them. Obviously they are for older kids because the way you need to weave and manipulate them is a little more complex. This simple activity takes advantage of the pretty colors the loom bands come in and makes it a preschooler-friendly activity! Of course, be careful of setting out loom bands if you have babies or toddlers who still put things in their mouths. I list corrugated cardboard in the materials below. Paper, cardstock or even single-layer cardboard are too flimsy and would buckle under the pressure of the elastic loom bands. 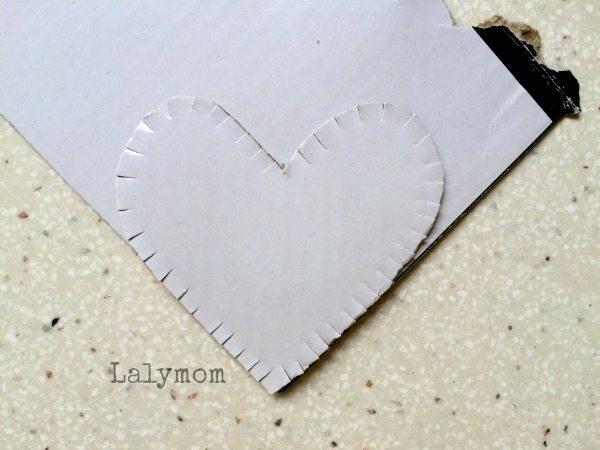 Cut out a few hearts from the corrugated cardboard, roughly 2 inches by 2 inches, making the right angle of the cardboard into the bottom point of the heart. Snip tiny cuts all the way around the heart for the loom bands to catch on. Place the hearts and loom bands into your busy bag, and you are all set. You may or may not choose to place a loom band or two onto one of the hearts to show what to do. 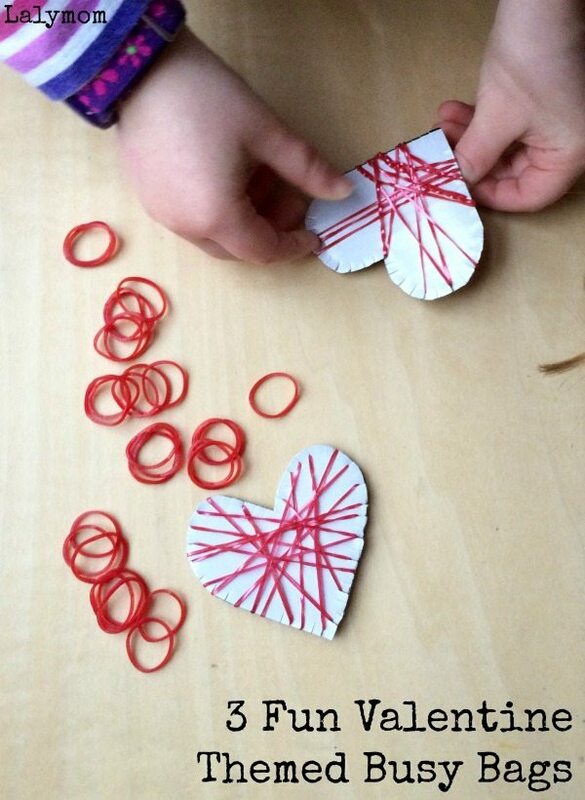 Your child can now design his or her own loom band heart! 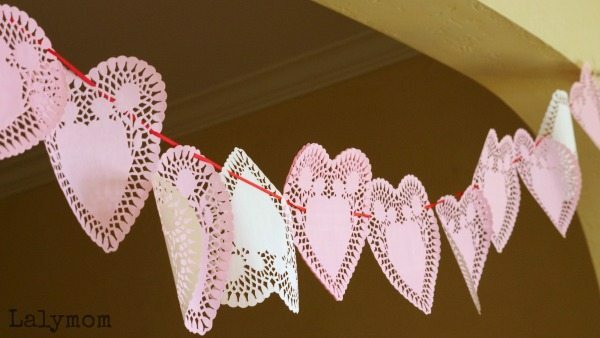 Simple doily heart garland busy bag. My preschooler loves to decorate for holidays. As soon as one is mentioned around our house, she will ask pretty often if we can make decorations (or MORE decorations) for that holiday. I really have enjoyed finding simple, low prep ways to engage her interests. This one was a no-brainer! She loved the idea of making a garland and knowing that we would hang it up made it all the more special. If some of the hearts were crooked or upside down or only attached by one hole, so be it. We both loved the finished results! 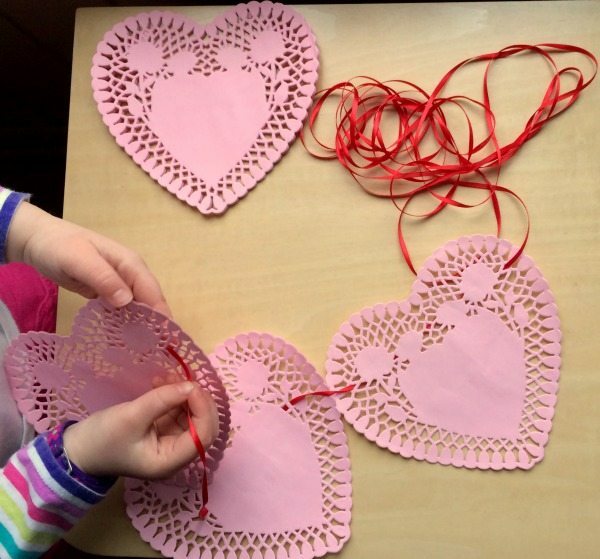 Kid-made Valentine's Day Garland, a perfect quiet time activity too! Cut a long length of ribbon – long enough to span a window, large mirror or archway in your house. 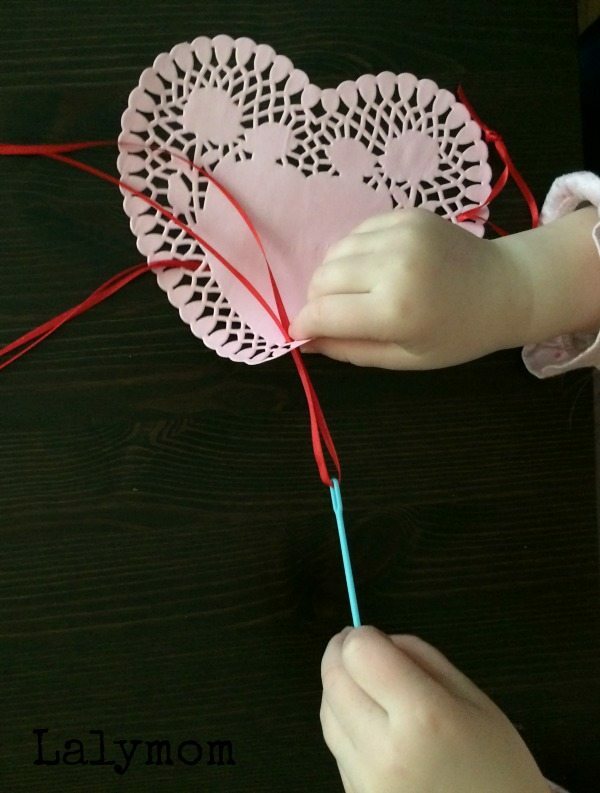 Place that and a stack of paper doilies into your busy bag. 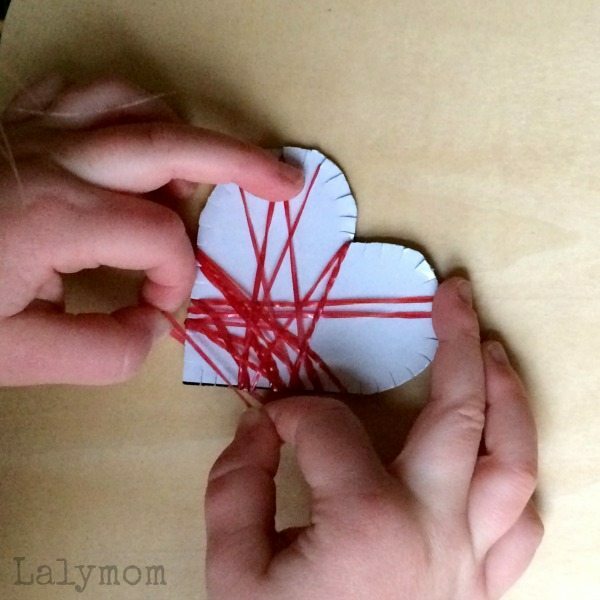 Show your child how to thread the ribbon down one hole and back up on the opposite side and slide the hearts down the ribbon. Be sure to hang up the results when the garland is finished! Ever since we did our Halloween Sewing Activity my daughter will occasionally ask if we can make something by using a needle and putting it up and down. I love that she is interested in doing things like that! We were having a crafty day this week and she asked if we could make something with a needle. 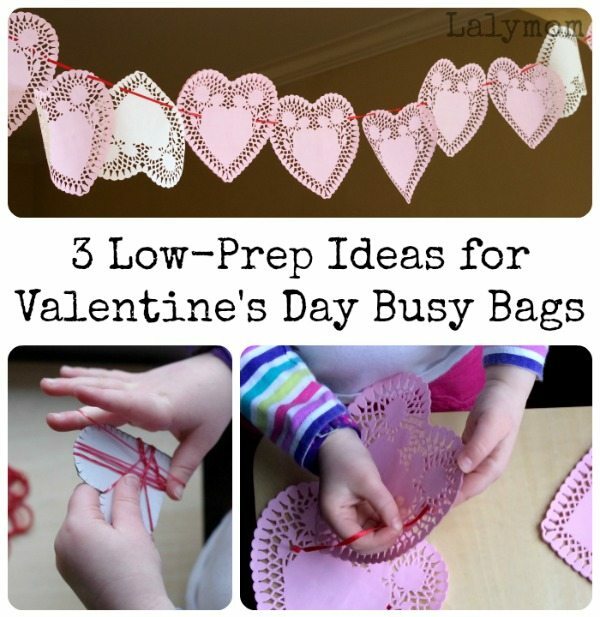 Doily alternatives: Craft foam hearts or cardboard hearts with holes punches around the edges. Cut a length of ribbon about twice the length of your arm, or longer. If desired, thread the ribbon onto the needle and tie a knot in the very ends to keep the ribbon on the needle. If possible, take a few of the paper doilies from the stack that are still stuck together, this will make it more sturdy. Place the ribbon, needle and doilies into the busy bag and it's all set! If needed, show your child how to thread the needle up and down through the holes and pull the slack carefully. That's it for our busy bags, but stick around below to see all the ones from the Busy Bag Blog Hop! 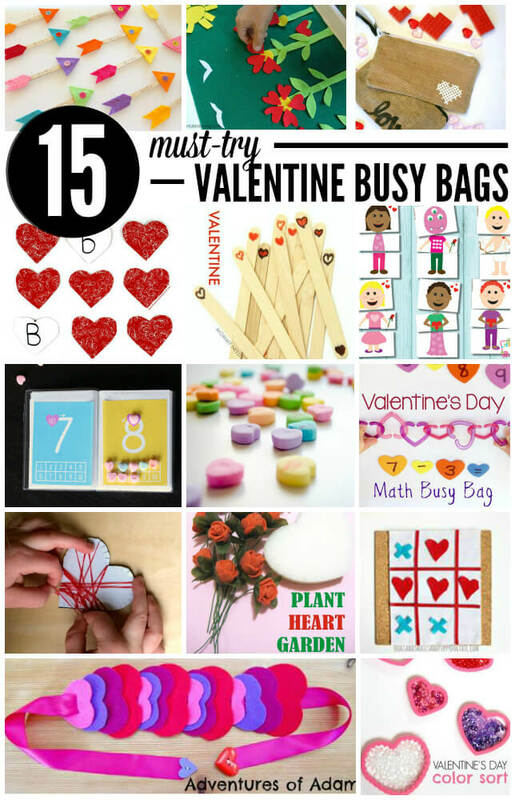 If you like this post, please do pin it and check out my other Valentine's Day Activities! It's time again for the Busy Bag Blog Hop! This month's theme, as if you couldn't tell, is Valentine's Day activities! Check out the other fun ideas from our co-hosts below! I am going to go prepare the heart looms for my kids to do this afternoon. What a great idea! Hope you enjoy it, it was a big hit at our house! What brilliant fine motor activities. Seriously genius. Sharing!! I think that even my older daughter (7) would enjoy these activities! Getting the heart loom ready for both of the for today afternoon!